Hiya peeps! And happy Thursday. I hope your week is going along splendidly. Today I’m back with more vintage goodness for your viewing pleasure. I’m actually sharing a pair of old crib frames I found on clearance for $10 at an antique shop last summer. Seriously, ten bucks for the pair. It was definitely a good day on the junkin’ trail. Originally I put these on the wall in our basement, but I never really liked them there. Eventually I took them down and they’ve basically sat in our garage since then. Sad, right? Completely unacceptable if you ask me. The fact that I couldn’t find a good spot for them was honestly driving me crazy. I couldn’t take it any longer, so I recently grabbed them from the garage and spent about 2 days walking around the house with them before I finally settled on a spot. 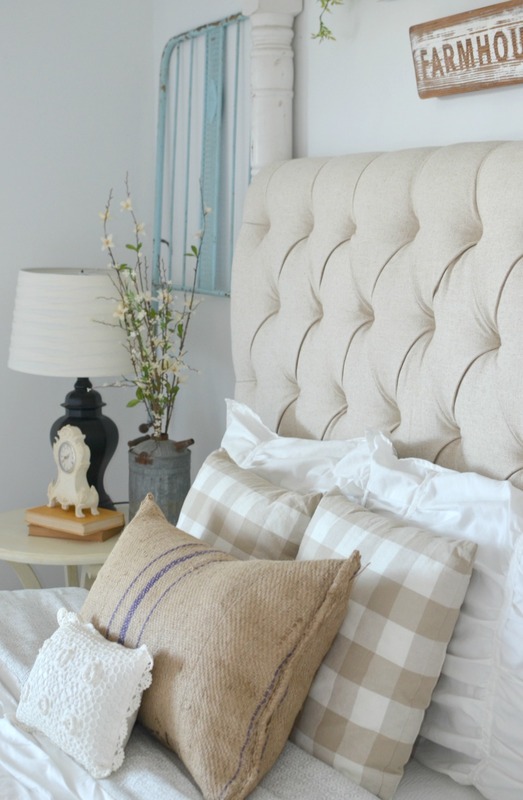 And the guest bedroom was the winner! Of course this meant I had to move a few other things around, which basically resulted in a bit of a spring refresh in our guest bedroom. That tends to happen a lot around here–I change one little thing and then before I know it BOOM. The whole room has been rearranged and everything is different. Surely you do this too, right? 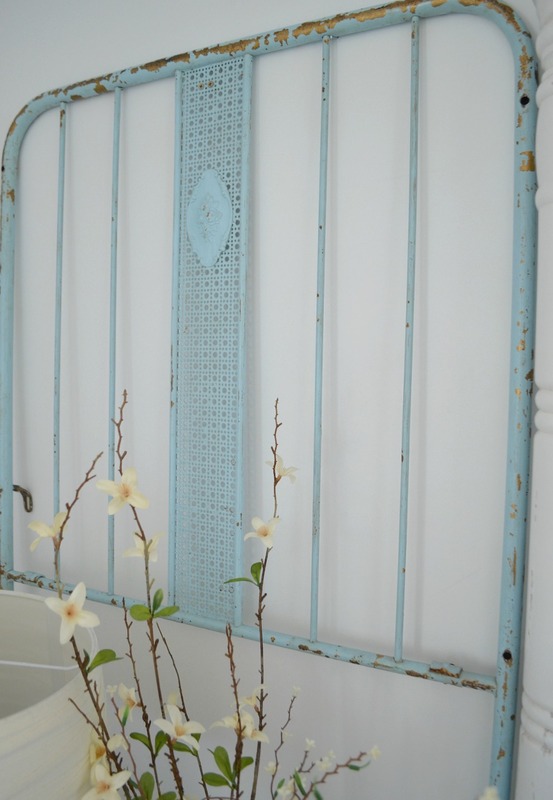 Aren’t these old frames the prettiest shade of blue? They’re exactly the pop of color this room needed. I considered putting a wreath on each one, but I decided that would just distract from their beauty. And if you’re wondering, I simply used a couple screws to secure them to the wall. 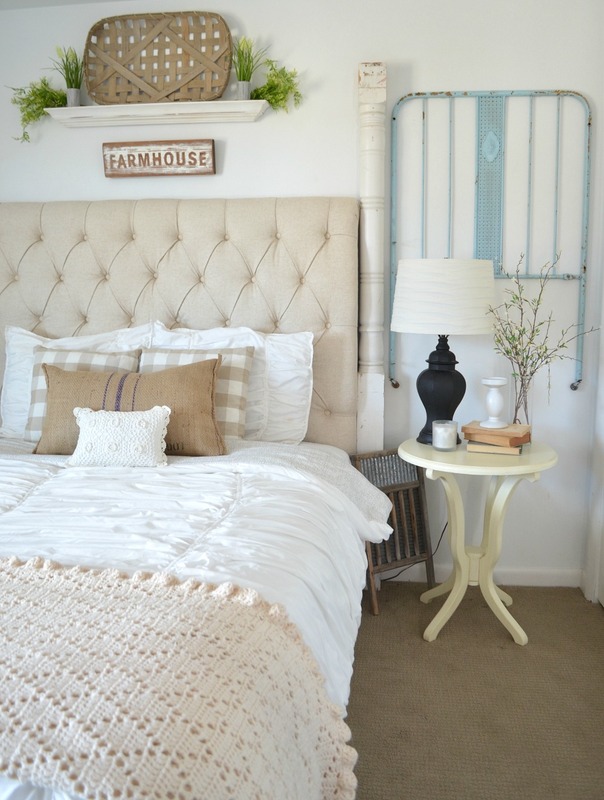 We actually found those large porch posts on either side of the bed at an auction last summer. We got 4 of them, along with a ton of old railings and spindles. I love using architectural pieces like this to decorate–it’s just a fun way to mix it up and add a bit of interest to the room. I still can’t believe I scored this pair of vintage crib frames for just $10. I just love how they look in this room, they’ve added some much needed charm and character to the space. Plus it feels soooooo good to know they’re no longer living a sad and lonely life in the garage. Shame on me for neglecting them for so long, that wasn’t cool. But at least they have a home now in our guest bedroom. I love them in here and I think this is the perfect spot for them. At least for now anyway! You never know when I’ll get the crazy notion to move things around and change up this room again. Pretty sure I’m addicted to rearranging all the things. Well that’s it for me today my friends. 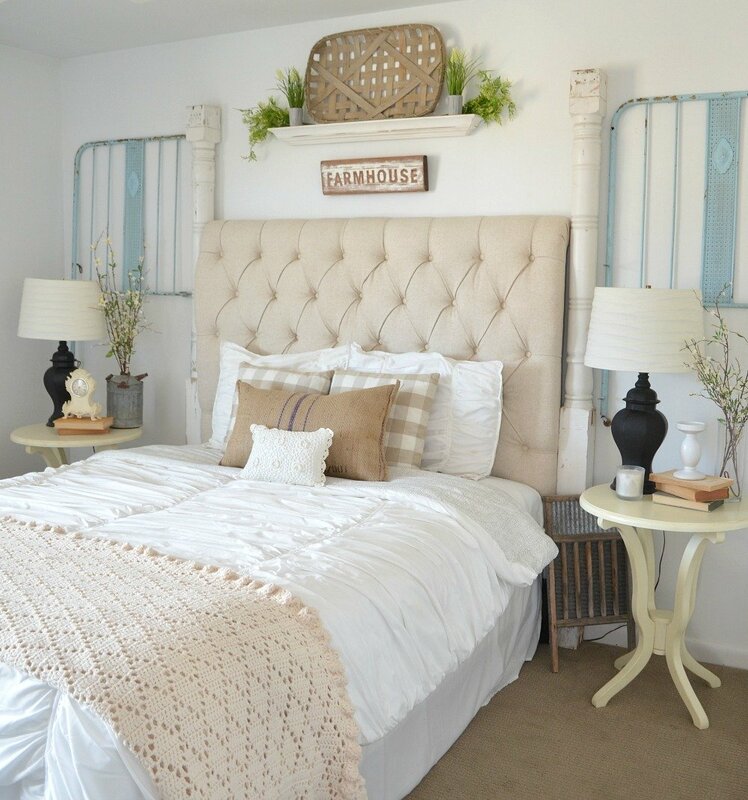 I’d love to hear what you think of my vintage crib frames and this cozy guest bedroom! Those are just lovely. They really made that room pop. 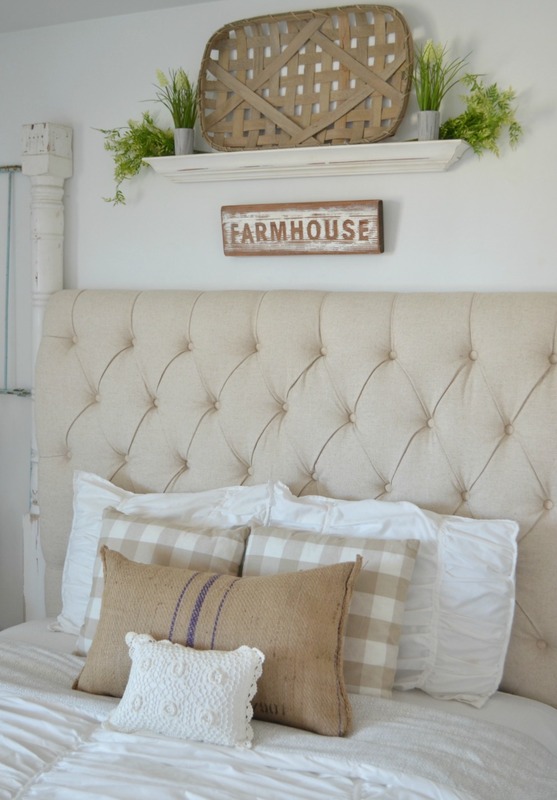 The room looks gorgeous and so farmhousey. I love those check pillows, where did you get them.? Thank you Ann! I found those pillows at Target. I am swooning over these -The color is sooooooo perfect ……. and you just have a gift for putting things together. I’m reminded of Proverbs 24:4 so often when I read your posts. Absolutely precious Sarah! Those were an amazing vintage find with that color! 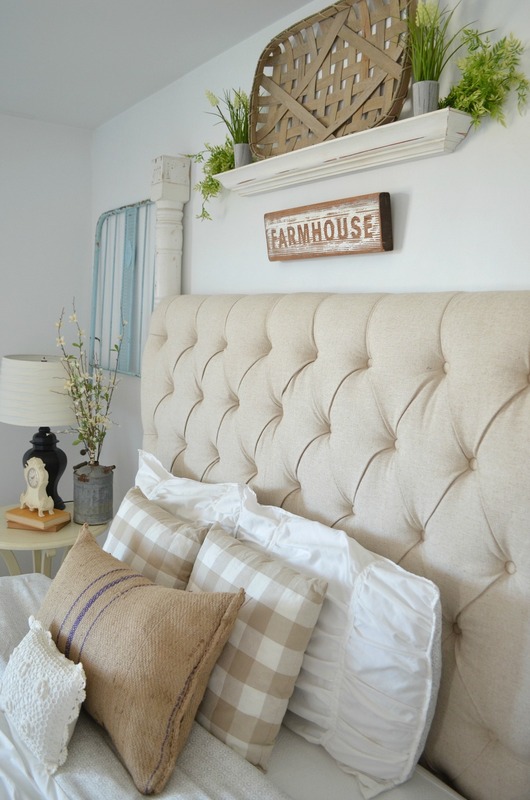 I can move one table or lamp or wall frame and that translates into a 3 room re-do… I love it!! Thanks for sharing such a darling room! You and me both Jana! It’s an addiction. But there could be worse things, right?! Very pretty love the color of the crib frames. Thanks Terry, I love that blue too! Love your style! Hope you are feeling well! Thank you Julie. I’m feeling great and I have a pregnancy update coming next week!! Eek! Yep, you definitely found a gem at bargain price. 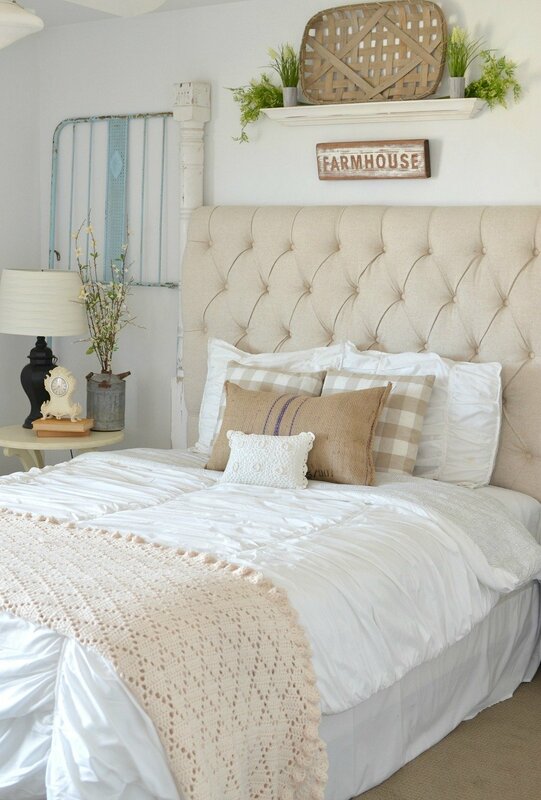 They really do add a lot of country charm and character to the room. Excellent find/ excellent space! Have a great day, thanks for sharing your ideas. Aw thank you so much Jody, I appreciate that! Right, Teri? I kind of want to take it over as my own room! They look amazing. I love the blue. 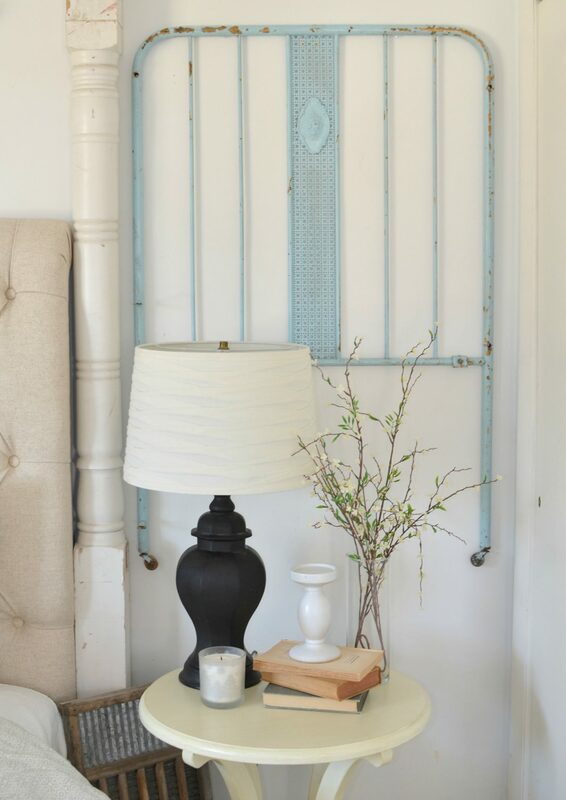 Something else to add to my junking list…..So pretty! Where is your bedding from? 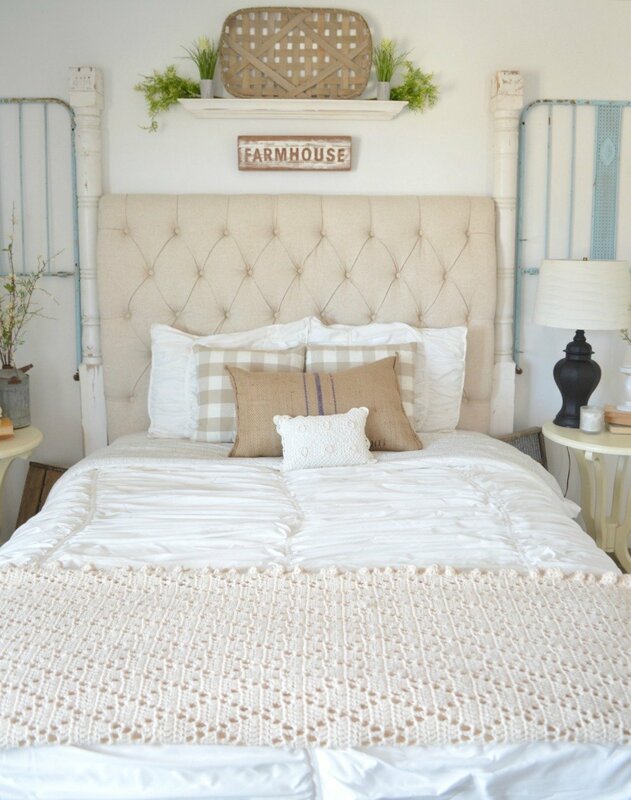 Love the comforter!! Hi Char. That’s from Target actually. 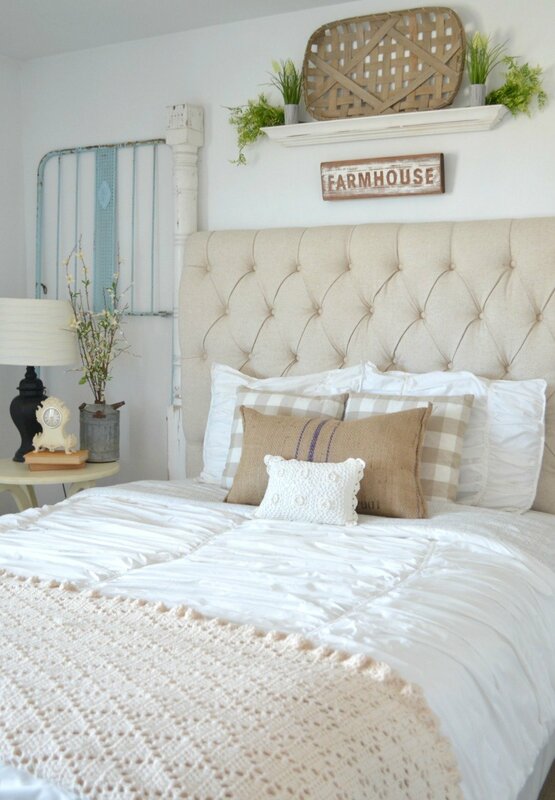 I wish I had the link but I can’t seem to find this exact bedding anymore.